Peter Roebuck had been a perennial component of ABC radio’s cricket coverage for just on 20 years. I had the good fortune to work with him during 12 Australian summers and three overseas tours. He was an esteemed colleague and an educator in the game. Through the shock and distress of his demise one delves, for succour, into the memories of the many good times. The overwhelming recollection is of a colleague unique for his intellect and insularity. But that’s not to say he was inaccessible; far from it. He wanted to share friendship and he provided company that – for its perception, stimulation and entertainment – we less-gifted mortals craved. But there were limits. Peter was both uniquely gifted and uniquely alone. 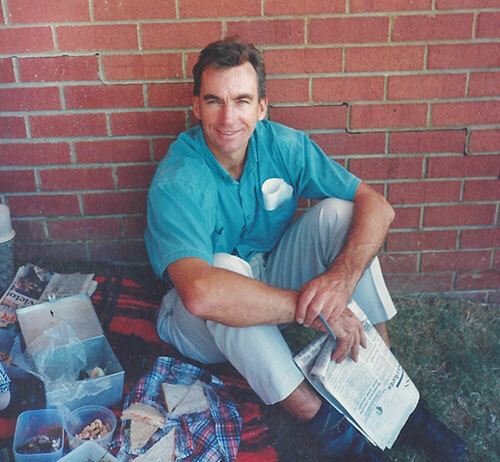 Peter Roebuck at the Adelaide Oval in 1994. He was a co-commentator’s delight. I would check our roster daily to see whether we’d be working together. You could discuss an issue with others over dinner, sleep on it, roll it into a challenging question-without-notice for Peter – live to air – in the first session next morning, and imagine that for once he might miss a beat. And such were his intellect, knowledge of cricket, and power with words that he’d instantly address the matter in all its complexity and more. He would invariably do it with respect, but could differ strongly from a colleague’s thesis if he was of opposing mind. Through the time of the Murali chucking row, Darrell Hair, and the Australian players’ threatened industrial dispute of 1997, we had some spirited disagreements. One day in Perth, as his debating skills were obliterating mine, we almost caused a scene in the breakfast room of the Sheraton Hotel. He made it his world and became a figure in every country where the game is played. He was particularly admired in India for his even-handedness and zeal for a game free of racial inequality. But even one as astute with the spoken word could land himself in hot water. In 1998, ABC radio covered Test cricket from India for the first time. On the first day of the series Peter and I were to “open the batting”; Jim Maxwell giving us a “thumbs up” on cue from Sydney. The cross was late and we chatted informally while we waited. As India’s openers strode to the wicket, Peter began telling me that one or two members of the home team – including the captain, Mohammad Azharuddin – were not above suspicion of match-fixing. Then our cue came and we launched into broadcast mode. Unfortunately, as can happen with long-distance radio, it was a stuff-up. We’d been on the air throughout Peter’s expose. It had been broadcast all over Australia and the following day appeared in all its glory in the Indian press. For once he was wrong-footed, though he wasn’t wrong on Azharuddin. Maxwell, who brought him to the ABC, was the last of his colleagues to speak with him and is understandably distraught. He and the national broadcaster have suffered a devastating loss. For 20 years Peter has enlightened, interpreted, and entertained; always without fear or favour. His voice had become part of the Australian summer. He even liked to think he’d taken on the sound of an Aussie. In reality, though, his was the voice of the cricket world. We are left with a haunting silence.